With the OD handle pushed in (engaged) it freewheels just like I pressed in the clutch anytime I lift off the accelerator. With the handle pulled out (disengaged) it acts like a normal 3-speed. Relay is good I think, I can hear it click when I ground the wire to the governor. I think the solenoid is bad. I ran a jumper straight from 12V at battery to the positive wire on the jumper, nothing. Ground wire is good. Is there any way to rebuild the solenoid? Any good source for a replacement? File the two sets of points in the solenoid with a points file, then spray them with contact cleaner and test again. The freewheeling is normal. As stated try the contact points first. That's a common problem. Also look up Van Pelt. There is a ton of info on the Borg Warner OD'S. I leave my overdrive engaged all the time. The only time the freewheeling is a problem is when parking. Be sure to put it in reverse and set the brake and you'll be fine. Tried cleaning the contacts, no go. I'm assuming the orange wire in this pic is the positive, correct? I cut both wires leading to the solenoid, green wire still is a good ground even disconnected. Just trying to hotwire this thing to see if I can make it click-clack. The blue wire is the hot one. The blue/orange wire goes through the kickdown switch and is only a ground path that's normally closed until you floor the pedal. You can bench test the solenoid by removing it and and using jumper wires to connect to your battery. Clamp it down or have a good grip on it when you do this, if it's in good nick it will jump when the armature extends. I respectfully disagree on the wiring. You are correct the blue power 12volt wire goes from the "solenoid" terminal on Relay to the solenoid pull in winding and holding winding. After the solenoid pawl energizes (extends) it opens the large heavy Pull in winding contact and now is held in the extended position with the hold in winding coil circuit. If the heavy pull in winding circuit doesn't open the contact it will burn out the pull in winding circuit . (the contact can be discolored , melted ,etc). The orange wire or a blue with a orange tracer is the ground out circuit. When the solenoid is not energized this orange wire is not at ground potential (no continuity between orange and ground. This orange goes thru the kick down switch on the normally open contact. This is with the kick down switch not pressed to the floor. The wire (White with a red tracer) on the other side of the normally open contact goes to the coil post marked "dist". When the solenoid energizes (extends pawl out) the small ground out contact on the top of the solenoid closes and has a circuit to ground. Of course the kick down switch is in the normal not pressed down position so nothing happens to the distributor terminal on the coil. When the kick down switch is pressed to the floor you break the governor normally closed contact circuit to the Relay TH SW terminal which drops out the Relay contact which breaks the power going down the blue wire to the solenoid. The solenoid can not retract because it is held under load in the balk ring. The only way the pawl can retract is By un loading the drive train. So at the same time you are breaking the governor circuit you are now closing the normally open ground out circuit on the kick down switch. 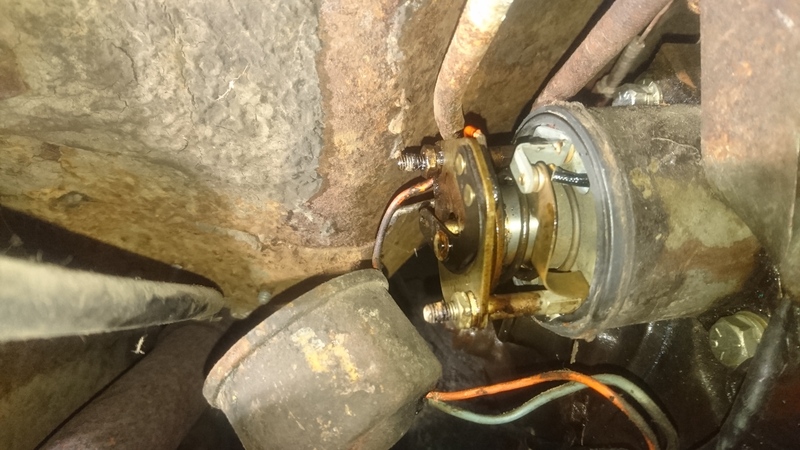 This now shorts out the ignition coil for a few revolutions and now the extended pawl in the solenoid can retract out of the balk ring and out of overdrive. When you release the kick down switch and are over the apex 28 mph. You will automatically go back into over drive. The handle always has to remain pushed in for the overdrive to function. Handle out you have a locked conventional 3 speed. The overdrive will only free wheel when in overdrive and under the apx 28 mph. cut in speed. When the overdrive is electrically energized it will not free wheel. Testing the solenoid on the bench jumper +12 volts to the "blue" wire and the ground side -12 volts to the solenoid case and the pawl should extend out. You can now check continuity between the orange wire and case ground which proves the ground out contact in the solenoid is working. Factory shop manual will have a great trouble shooting section and the correct wiring colors per your vintage. You are correct you must put transmission in reverse to stop the car from free wheeling down the hill.. plus use your parking brake. Disagree with what? I figure the OP is able to read a wiring diagram. I didn't mention the rest of the story as you did because it wasn't germane to the subject, testing the solenoid. He hooked up a jumper to the wrong wire to test it which, incidentally, will cause no harm to the solenoid. If he hooks the jumper to the correct wire he should hear it snap if it's good. If the either (pull-in/hold-in) coil is bad, solenoid cannot be rebuilt. Even if it works on the bench, sometimes the coils get weak and won't operate the overdrive reliably (I once built a resistance jig to bench-test solenoids). If you decide to fork over an arm-and-a-leg for a NOS unit, be sure it can be returned, since many defective new parts often made their way back into stock somehow. If you DO buy a replacement, don't toss the old solenoid since many of it's parts can be used to rebuild others. Van Pelt Sales has new manufacture solenoids, 6V only last I checked. Fifth Avenue Antique Auto also has brand new ones in both voltages. Bring $$. One word of caution: check that the points are adjusted correctly on any solenoid you buy, new or used. The pull in coil points MUST open as soon as the armature fully extends. If the pull in coil remains in the circuit the solenoid will fail in short order due to burnt out windings. They can be rebuilt, there's a guy who advertises in Hemmings Motor News, J. Pinto. I've used him before and am satisfied with his work. There is definitely something screwy going on. I cut both wires going to the solenoid to troubleshoot. Green wire coming out of the solenoid is grounded, I did not try energizing it, because it's grounded, pretty sure it's just going to throw sparks. Orange wire does nothing when energized, but I'm pretty sure that is expected. I'm thinking there must be an internal short somewhere inside the solenoid shorting the SOL wire to ground.